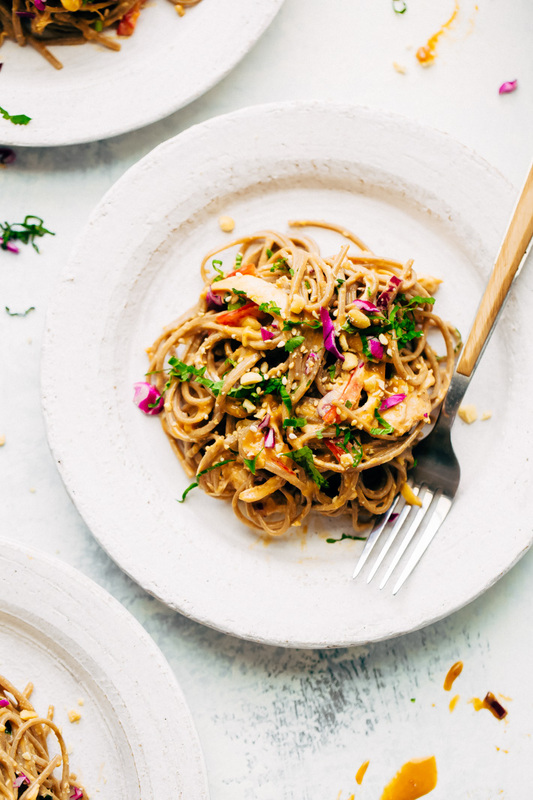 A rainbow Thai noodle salad loaded with shredded chicken, sliced veggies, and drizzled with a quick, homemade peanut lime dressing that’s the perfect balance of sweet, spicy, and tangy! Eat it at room temp or straight cold from the fridge, it’s so good! We’ve got noodles! And peanut sauce! But the best part, I’m allowed to call this a salad! LIFE MADE. Extra exclamation points all round. It’s all about the rainbow veggies in this little Thai Noodle Salad number. Start with what you’ve already got in the fridge and don’t you forget those herbs! I’m loading this salad up with basil, cilantro, and tons of thinly sliced scallions. The herbs really bring so much freshness to the party. It’s the kind of salad that’s bright, colorful, and flavorful. 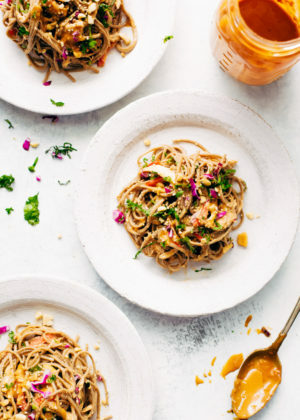 Thai chicken noodle salad is generously drizzled with my homemade peanut lime dressing that’s balanced with all the sweet, spicy, tangy, and salty flavors. Someone hand me a fork; I’m done talking. The plan is to slurp up all the noodles. 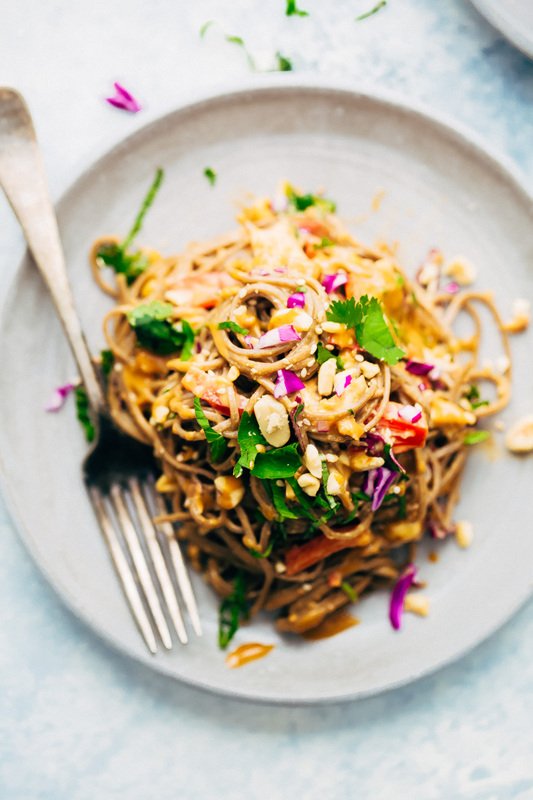 What’s even better about this Thai noodle salad is that it’s completely weeknight friendly and perfect to box up for lunch the next day and eat cold from the container for a quick desk lunch. If you’ve got cooked shredded chicken in the freezer just pop it in the fridge to thaw while you’re at work or grab a warm rotisserie chicken on the way home. I’m happy to report I’ve upped my adulting game just a hair. You can find me generously drizzling bone-in, skin on chicken breasts with olive oil and sprinkling it with a little bit of garlic powder, salt, and pepper and popping it in a 375º oven for 40-50 minutes on Sundays so I’ve got shredded chicken in the refrigerator for quick weeknight meals. Can I give you a lazy person pro tip: pre-shredded cabbage for this recipe as it cuts down on prep time. Boil the noodles, chop the veggies and make the dressing while that’s going on and dinner is at your fingertips in no time. And you know what’s great? It’s got your chicken//veggies//carbs all in one so serve yourself a big portion and call it a day! Friends who eat low carb — swoodles (sweet potato noodles) carroodles (carrot noodles?) or zoodles! And if you’re super cool, you’ll do a combination of all three. Also, what makes me love this Thai salad a little more is how it easily helps you clean out the refrigerator. I have this one thing where every time I buy scallions, they either go bad in 20 seconds or I never get around to using them. So guess what? This chicken satay inspired salad is great for using up the leftover herbs and veggies that would otherwise get chucked. A little basil, oh who am I kidding, A LOT of basil and cilantro and some chopped scallions? Why, yes, don’t mind if I do! 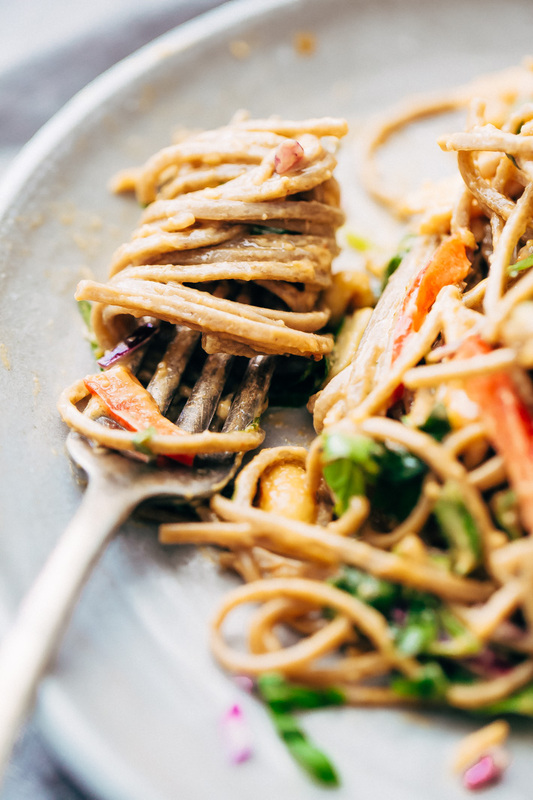 Let’s talk about the peanut lime dressing for this Thai Noodle Salad. It’s very similar to the peanut dip I use for my Vietnamese Spring Rolls , we just play around with the quantities of the ingredients a bit.The first ingredient, peanut butter — no brainer there. But, keep in mind the kind of peanut butter you use will effect the outcome of your dressing. I used the organic stuff, you know the kind that usually has a huge pool of oil near the top and requires some major upper arm strength before you’re allowed to spread some on toast? As this kind of peanut butter is naturally thinner (when you finally get it all stirred together), you’ll need less water to make the dressing. Conventional peanut butter will need a little more water to loosen the dressing to a pourable consistency. For the dressing, you’ll also need minced ginger, garlic, soy sauce, brown sugar, lime juice, and sriracha. The amount of sriracha is totally your call. 1 tablespoon yields a pretty mild dressing and 3 yields a spicier outcome. 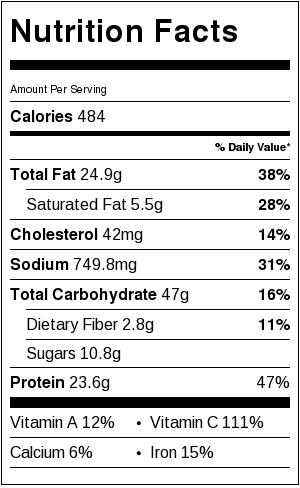 My sweet spot is about 2 tablespoons and we don’t find it to be unbearably spicy. Top your salad off with a handful of crushed peanuts and toasted sesame seeds. 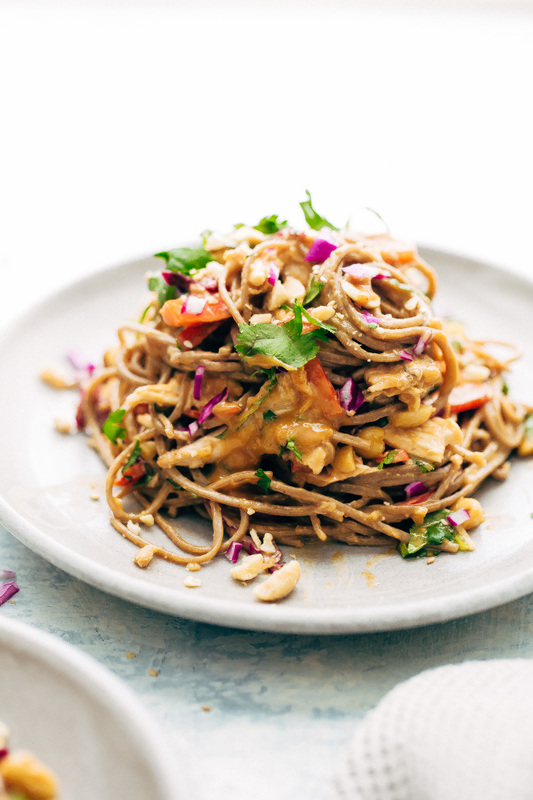 May your Monday bring you fork loads of Thai noodle salad nuzzled up in that creamy peanut lime dressing. Noodles: Heat a large pot of boiling water and cook the noodles according to package directions. Dressing: Combine all the ingredients for the dressing in a bowl except the hot water and whisk together, add 2 tablespoons of water and continue to whisk. Raise the whisk to see if the dressing easily falls in ribbons, add additional water to help thin dressing until it does. 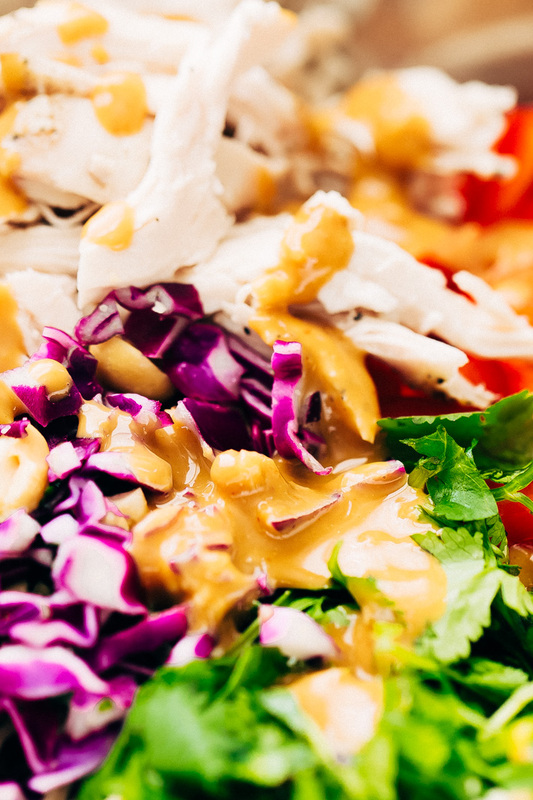 Taste the dressing, adjust the salt and sriracha to preference. Assemble: In a large bowl, toss together the noodles with the dressing. Add the chicken, cabbage, basil, cilantro, scallions, and bell peppers. Toss everything together. If the dressing appears to be too thick, add a little bit more hot water to help stir everything together. Taste and adjust salt and pepper. When serving, top with chopped peanuts and toasted sesame seeds. I like to serve with additional lime wedges because you can never have enough! This recipe uses most of the veggies I’ve usually got on hand and that we’re always scrambling to finish before the clock runs out, you can certainly add other veggies to this recipe too!